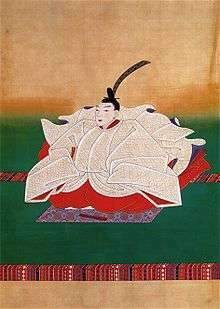 Emperor Go-Momozono (後桃園天皇, Go-Momozono-tennō, August 5, 1758 – December 16, 1779) was the 118th emperor of Japan, according to the traditional order of succession. Go-Momozono's reign spanned the years from 1771 through his death in 1779. This 18th-century sovereign was named after his father Emperor Momozono and go- (後), translates as "later", and thus, he could be called the "Later Emperor Momozono", or might be identified as "Momozono, the second" or as "Momozono II". He was the firstborn son of Emperor Momozono. Hidehito was passed over when his father died. He was too young to be emperor at that time. August 5, 1758: Prince Hidehito is born, the first son of Emperor Momozono. 1768: Hidehito-shinnō was named Crown Prince and heir. January 9, 1771: Empress Go-Sakuramachi abdicated in favor of her nephew, Prince Hidehito; and his reign started immediately. February 29, 1772 (Meiwa 9, 26th day or the 1st month): "The Great Meiwa Fire" – one of the three greatest Edo fire disasters. Unofficial reports describe a swath of ashes and cinders nearly five miles wide and 15 miles (24 km) long—destroying 178 temples and shrines, 127 daimyo residences, 878 non-official residences, 8705 houses of hatamoto, and 628 blocks of merchant dwellings, with estimates of over 6,000 casualties. All this devastation subsequently engendered the costs of reconstruction. August 2, 1772 (Meiwa 9, 4th day of the 6th month): A tempest struck the Kantō region, causing floods and ruining crops. August 17, 1772 (Meiwa 9, 19th day of the 6th month): Another storm brought flooding and high winds to the Kantō region, destroying an estimated 4000 houses in Edo alone. 1772 (Meiwa 9): This was called the "year of trouble" because it was marked by an extraordinary succession of natural calamities. a contemporary pun was made linking the words "Meiwa" + "ku" (meaning "Meiwa 9") and the sound-alike word "meiwaku" (meaning "misfortune" or "annoyance"). 1772 (Meiwa 9, 11th month): The nengō was changed to Anei (meaning "eternal tranquillity"); but this symbolic act proved to be futile. 1775 (An'ei 4): Epidemic diseases spread across the country – in Edo alone, an estimated 190,000 died. 1775 (An'ei 4): Swedish pyhsician and botanist Carl Peter Thunberg arrives at VOC outpost or "factory" in Nagasaki bay; and his scientific activities will result in the first detailed, descriptive survey of the flora and fauna of the Japanese archipelago. 1778 (An'ei 7): Volcanic island of Sakurajima erupts one mile away from Kagoshima – 16,000 died. 1779: The emperor adopted a son from the Kan'in branch of the Imperial family; and this son would become known as Emperor Kōkaku. June 12, 1779: The emperor died at the age of 22. Go-Momozono's kami is enshrined in the Imperial mausoleum, Tsuki no wa no misasagi, at Sennyū-ji in Higashiyama-ku, Kyoto. Also enshrined in this location are this emperor's immediate Imperial predecessors since Emperor Go-Mizunoo – Meishō, Go-Kōmyō, Go-Sai, Reigen, Higashiyama, Nakamikado, Sakuramachi, Momozono and Go-Sakuramachi. The shrine complex also encompasses the misasagi of three of Go-Momozono's immediate successors – Kōkaku, Ninkō, and Kōmei. 1 2 3 Ponsonby-Fane, Richard. (1959). The Imperial House of Japan, p. 120. 1 2 3 4 Hall, John. (1955). Tanuma Okitsugu, p. 120. 1 2 3 Hall, p. 121.